Once upon a time there was a dry dusty desert. Wolves and mice fought for seeds, cougars ate leaves, and everyone was hungry. One day a little girl named Carnita was walking to the store. Her mother had given her three pennies to buy a bag of beans. On the way she met a Bruja named Asada. Carnita, not one to be fooled easily, was suspicious. See some early pix of the guitar project. 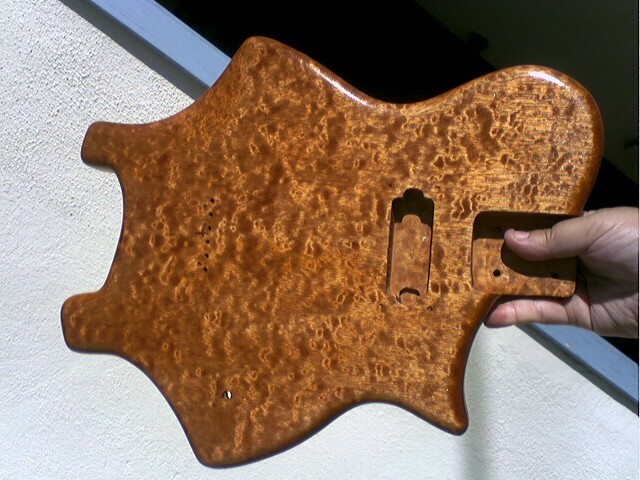 Here’s another pic of the guitar body. It has received several coats of boiled linseed oil, tung oil, and lacquer. Pretty! Well, after some patient prodding I finally reconnected with Randy, who did the last few bits of shaping. He rounded off the neck heel, and a few transitions on the curves leading into and away from it. This, of course, required me to completely disassemble the guitar. After he finished that last bit of shaping, I was able to start on the finishing process. The finishing process is one that requires patience. The first step is sanding, followed by sanding, then more sanding. After that, I applied several thinned coats of boiled linseed oil. Here are some pix taken after the oil was applied.